Use a non-stick frying pan to make kheer. Wash rice, changing water until the water appears clear. Melt the butter in a frying pan on medium heat. Add the rice and stir-fry for 2 minutes. Add the milk, cook until the rice is tender and the milk is creamy and reduced to about half. Stir often to ensure the milk does not burn in the bottom of the pan. Add the sugar, saffron, cardamom, almonds and pistachios and let simmer for a few more minutes. 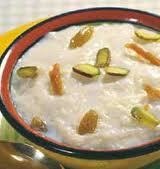 As kheer cools of will become thicker in texture. Kheer can be served chilled or warm. 1. Cook sugar and water on a low flame till sugar melts. Set aside. 2. Heat the ghee till very hot. Turn down heat and fry semolina till light brown. 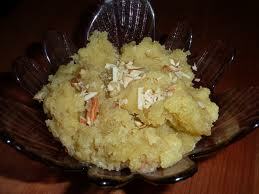 Keep stirring constantly to prevent the semolina from getting burnt. 3. Add cardamom powder, raisins and cashew nuts. 4. Add sugar water to the semolina mix and stir rapidly to prevent lumps. 5. Cook over medium heat until the water gets completely absorbed.